Not even a wall can keep these lovers apart. 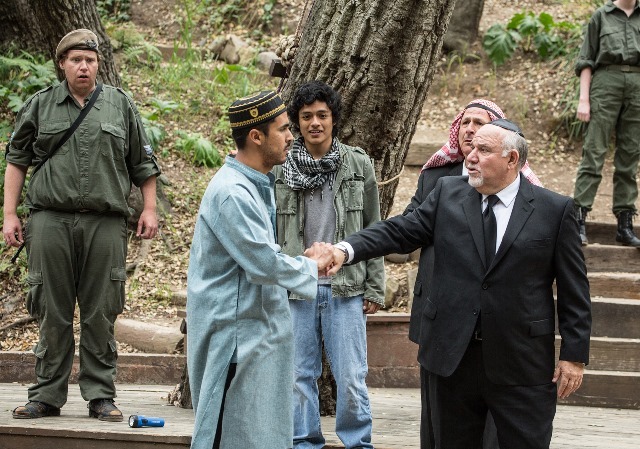 This particular wall happens to be in modern-day East Jerusalem and as Theatricum Botanicum’s production of Romeo and Juliet commences, chaos ignites at a checkpoint that divides Israel and Palestine. It is a city that has seen struggle for thousands of years and for one Muslim boy named Romeo and one Jewish girl named Juliet, not even their innocence can change the course of this story. Following a prologue that ominously shakes its finger at what’s to come, director Ellen Geer’s opening sequence flashes to life in a rush of sound and movement. I could feel my heart start to race as the briskly choreographed fight scene reached its pivotal high point. Geer’s production wastes no time in defining the stakes of this all too real world and the intensity of fight choreographer Aaron Hendry’s skirmishes pulse like a pressure cooker as pent-up emotions erupt again and again. The show connects on a visceral level because the Middle East’s ongoing crisis, though half a world away, still has repercussions in our own back yard. Local actions have global consequences and, until we accept that we all bear the burden of that responsibility, peace will remain elusive and loss is inevitable. The Capulets and Montagues show us how devastating that loss can be. Geer brings a fresh eye to this well-known tragedy and scenes that have become predictable elsewhere here sparkle with fresh delight. Romeo and Juliet’s “hand” dialogue, upon their meeting, is full of previously undiscovered humor and the balcony scene is a beautifully staged realistic enactment, both touching and adorable. At the heart of the play’s success is a pair of young lovers – emphasis on the “young” – who do not overlay sensuality and adult sensibilities onto their roles but instead capture the giddy, ebullient energy of first love with all its wonder, awkwardness, and idealistic brilliance. Shaun Taylor-Corbett’s Romeo is ready to burst at any moment, early on by comically venting his frustrations like a little boy acting out, and later, with such delirious joy that it seems he will lift off and take flight as he falls head over heels in love. Likewise, Judy Durkin’s Juliet is a naïve little girl, unskilled in the harsh realities of the world and so lacking in guile that you can’t help smiling at her giggling charm. So becoming is this young pair that it makes the horrible consequences of the story even more heartbreaking. Throughout the production you’ll find many original interpretations of Shakespeare’s familiar characters. Some are due to the setting, like Steven B. Green’s holy man Mufti Zaman (Shakespeare’s Friar Laurence) and Taylor Jackson Ross’s Israeli soldier, Tybalt, while others have found qualities that give their characters new dimension. Absolutely endearing is Melora Marshall’s Nurse, a playfully childish woman with such love for her charge that her whole being lights up whenever Juliet enters the room. And in Alan Blumenfeld’s Capulet we see the subtleties within a man who can often be dismissed as simply the angry father, rather than a father struggling to keep his family safe. As befits Theatricum’s beautiful outdoor environs, the staging incorporates a wide and interesting variety of playing areas from the main stage, to the rooftops above and behind the audience, to the many levels afforded by the hillsides themselves. Costumes are mix of modern practicality with period pieces added for accent where appropriate and the sound design includes everything from a DJ performing a rap based on the biblical story of Esther at the Purim party to traditional Middle Eastern music. It is the right time to tell this story in this way. Geer creates a potent contrast with her interpretation of Shakespeare’s tragedy by setting the innocence of youth against the dramatic tension of a land in religious turmoil. At times it may seem hopeless that there can be any effectual change, much like the world around us today. But even as the story bitterly ends, a final epilogue gives hope that there is room for peace among even the deadliest of enemies. A timeless story never gets old especially when the telling is done in such an exemplary manner. 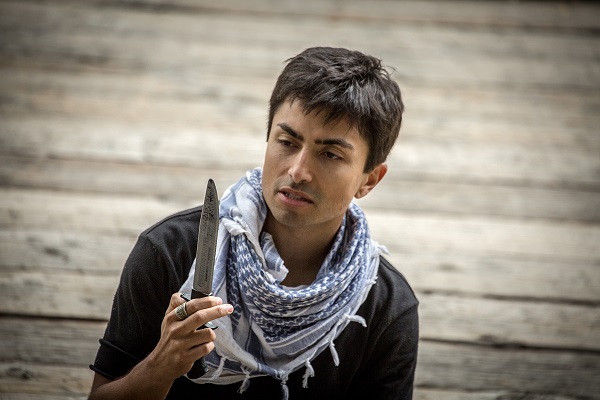 Theatricum’s Romeo and Juliet is a masterpiece masterfully told and a thought-provoking reinvention of Shakespeare’s classic that should be at the top of your destination list this summer. Tickets range from $10-$38.50; children 4 and under are free. The outdoor amphitheater at Will Geer’s Theatricum Botanicum is terraced into the hillside of the rustic canyon. Audience members are advised to dress casually (warmly for evenings) and bring cushions for bench seating. Snacks are available for purchase, and picnickers are welcome before and after the performance. Thanks Karen! I wish I’d seen if you were available to go.